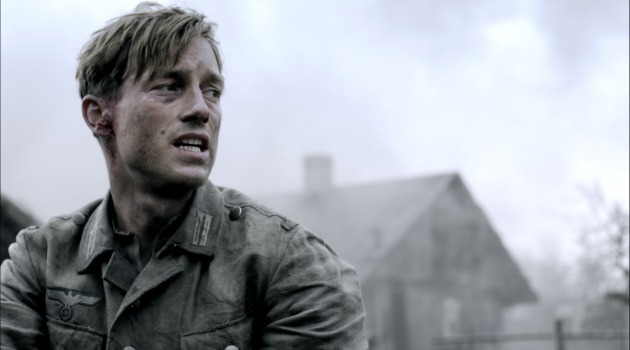 These haunting words of advice are offered to Lt. Wilhelm Winter by his superior officer as he struggles with the mounting atrocities and terrors on the Eastern Front of World War II in the excellent German television miniseries “Generation War”. Originally airing in Germany and Austria in March 2013 as a three-part series, Music Box Films has acquired the US distribution rights and will be screening the epic 279 minute film in two parts starting this weekend. 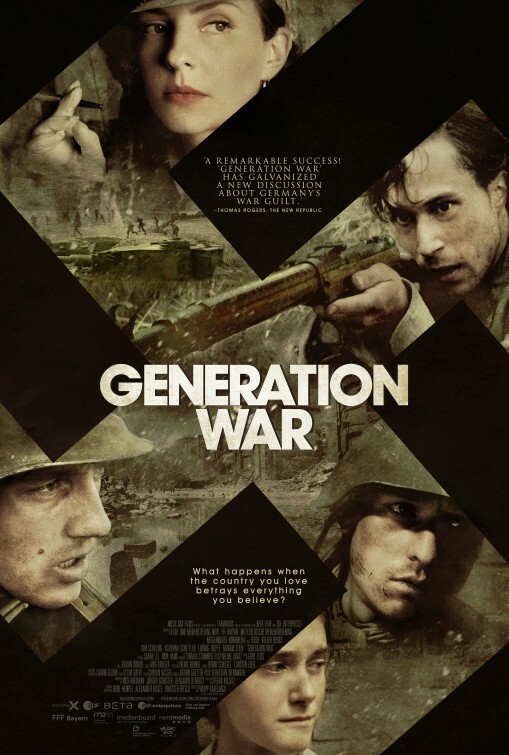 Billed as a “German Band of Brothers”, “Generation War” indeed stands as one of the strongest German produced works on WWII, ranking up there with 2004’s “Downfall” and 1993’s “Stalingrad”. The films open in Berlin in June, 1941, where five childhood friends have gathered at a bar to celebrate one last time before leaving. Wilhelm Winter (Volker Bruch) and his younger brother Friedhelm (Tom Schilling) have enlisted in the German Army and are shipping out to the Eastern Front to take part in the invasion of Russia. Charlotte (Miriam Stein), who secretly longs for Wilhelm, has joined the nursing corps and will be headed to the frontline hospitals to treat wounded soldiers. Viktor Goldstein (Ludwig Trepte) is a Jewish tailor working for his father, while his girlfriend Greta (Katharina Schüttler) dreams of a singing career and becoming the next Marlene Dietrich. From here, we follow the lives of these five characters in sometimes interlocking storylines for the next four years through to the end of the war. Wilhelm is the more experienced soldier with previous combat time, while Friedhelm is a more poetic soul, seen as weaker by his fellow soldiers. Together they plunge headlong into the brutal warfare of Hitler’s Soviet invasion. The early days fly by as the blitzkrieg storms through Russia, and the men talk of victory and being home by Christmas. However, after the assault slows during the rainy season and grinds to a halt amid the vicious Soviet winter, their morale and humanity begins to erode from increasing defeats, as well as atrocities perpetrated on the local populace by the Nazi hierarchy. The action scenes are all filmed in the now ubiquitous “Saving Private Ryan” style, with shaky handheld cameras and bullets zipping by your head in stereo surround sound. The film apparently didn’t have the budget to film large-scale battle scenes such as the Battle of Stalingrad or the massive tank battle at Kursk, but chose instead to show more intimate, squad based action ala “Band of Brothers”, and does a great job of showing the chaos and intensity of urban warfare. While the Winter brothers are mired in the horrors of the Eastern Front, Charlotte is witnessing firsthand the cost of all this warfare at a combat hospital on the frontline. At first shocked by all the carnage, she quickly becomes inured and hardened by the constant bloodshed and slowly changes her viewpoints on Nazi fanaticism and their talk of a “Final Victory”. After hand-picking a nurse from an army of volunteers, she eventually finds out that she is a Jew, and becomes torn between either keeping her secret or exposing her to her superiors. And back home, problems abound for the Jews in Berlin, as Viktor becomes more and more frustrated with the increasing demands put on them by the Nazi party. Sensing that things will only get worse, his girlfriend Greta begins an affair with a Nazi officer in order to secure visa papers for Viktor. This also helps launch her singing career as she ends up becoming a morale-boosting performer for the troops. However, all the trickery and shadowy deals end up costing them dearly, as Greta arouses the attention of the Nazis at home, and Viktor gets betrayed and sent to a work camp. Later, Viktor teams up with members of the underground Polish resistance movement, where his own morality and identity is severely tested. 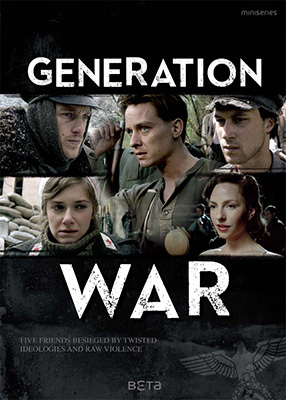 “Generation War” has generated plenty of controversy since its release last year. 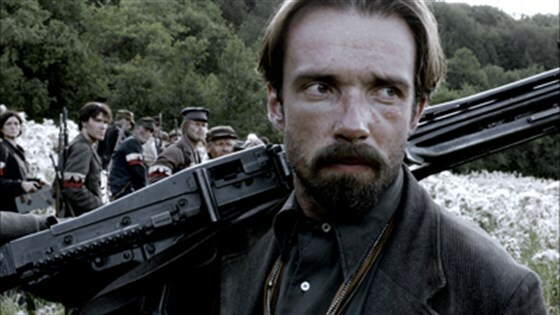 Some critics have complained that the film whitewashes history by leaving out Nazi atrocities, and that it shows the Russians and Poles in a negative light in comparison to the German soldiers. I felt however that the film showed atrocities committed by all sides, and attempted to deliver a more complex assessment of the combatants involved. Not all German soldiers were saints condemning the atrocities of the SS and their more fanatical Nazi superiors, but they certainly weren’t blameless either, and the film does an excellent job portraying this. Also, Polish critics have complained vigorously about the anti-Semitic behavior of the Polish resistance movement in later scenes, and while this is true in the film, I felt it was used more to underline Viktor’s alienation than as a means of rewriting history. Viewers interested in perhaps more accurate cinematic treatments of the Polish underground during WWII are well advised to see the war film trilogy of Andrzej Wajda, “A Generation”, “Kanal” and “Ashes and Diamonds”. “How did you get like this?” asks one of Friedhelm’s comrades. “You have to resist the temptation to be human,” he replies. This is the major theme of “Generation War”, attempting to maintain ones humanity in the face of unrelenting evil, death, bloodshed and hopelessness. War films from the German point of view capture this feeling especially well, as the jingoistic patriotism seen so often in Western war films is tossed aside and we can fully comprehend the nihilistic despair and futility of war. History is often written by the winners, but this is from the losing side, and as we watch these five eager and optimistic young Germans slowly have their lives destroyed by this cruel and pointless war, we feel their loss as the loss of millions just like them.